We provide a modern, reliable fleet of purpose-built furniture trucks. Sizes range from 10m3 through to 38m3 capacity. We will have one to suit your household moving requirements. Many of our furniture trucks can be driven on a standard car licence. 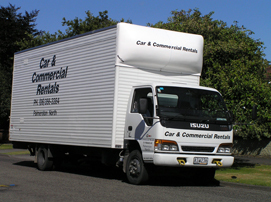 From Palmerston North to Wellington, Hawke's Bay, Taranaki or around New Zealand, our trucks can cater to your needs. 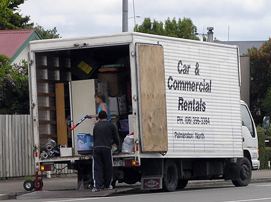 Moving between the North and South Island, furniture trucks need to be fitted with ferry tiedowns. We have vehicles ready to go that will meet Inter-island ferry requirements that can be driven on both car and truck licences. Q: What have you got? A: We provide commercial rental furniture trucks, cars, vans, mini buses, 4 wheel drives, baggage trailers, tip trucks, and utes. Click here to see our furniture removal trucks. A: We can schedule around your needs. Please contact us for more details. Q: How many vehicles have you got? A: Contact us for pricing. Q: When can I pickup the vehicle? A: Weekdays, 8am – 5pm, Saturday 8am – 11:30am or by arrangement. • Trucks are always clean and full of fuel which ensures you can get moving as quickly as possible. • We provide off-street parking for your personal vehicle which saves you time and ensures your vehicle is safe. • All trucks and vans/ mini-buses are diesel which are cost efficient.